A recent post on peri-solstice perfume mania got me thinking about seasonality in fragrance use. Being a scientist, I love data—so I started monkeying around with Google Trends to see if I could find anything interesting. And I did. Trends produces a Search Volume Index for any search term you give it. 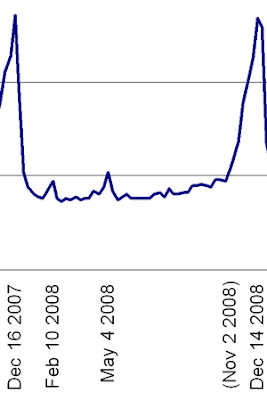 By default it spits back a weekly data series from January 4, 2004 to the present. It also scales the data; in other words it sets the average search traffic volume to 1.0. Episodes of heavy search volume appear as peaks on the resulting graph. You can also view results country by country. The first thing I did was look at searches for “perfume” in the United States. A glance a the resulting graph (above) shows three annual features. First, a huge Christmas traffic surge. The uptick begins the first week in November and peaks just before Christmas (December 12 to 20). Note: these weekly results are dated each Sunday; I assume they are week-ending dates, but Google is not explicit about this. 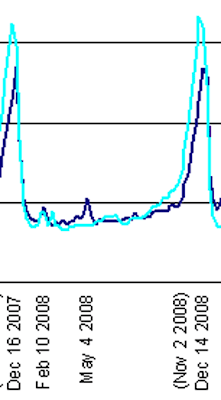 Second, a small but reliable bump in search traffic preceding each Valentine’s Day (February 14th). Third, a small but reliable bump in search traffic preceding each Mother’s Day (the second Sunday in May). I’ve dated each peak and (in parentheses) the start of the pre-Christmas uptick. Peaks in search activity around Christmas, Valentine’s Day and Mother’s Day confirm what is common knowledge in the industry—that the majority of perfume sales occur in the time span of these three holidays. Presumably the data reflect people (mostly guys?) looking online for the right gift. How general are these American results? The graph below shows the American data along with those from big English-speaking countries with a common heritage: Canada, Australia and the UK. Again, all three annual peaks show up. There is one anomaly: while the Christmas and Valentine’s Day peaks overlap perfectly, the French Mother’s Day peak either lasts longer or begins later than the American peak. I’m not sure why. Is Mother’s Day celebrated in France? Does it have the same date? Or is something else going on? I’d love to hear from readers who have an idea about this. Elsewhere Italy, Spain and Mexico all show Christmas peaks; China, Hong Kong and Japan do not. The cool thing about the enormous sample sizes available from Google Trends is that you can pick up search responses to unique events. Germany, which has an annual Christmas peak but no Valentine’s or Mother’s Day peaks, had an enormous one-time surge in “parfum” search that peaked on September 10, 2006. The German release date of the movie Perfume: The Story of a Murderer, based on the original German novel by Patrick Süskind, was September 14, 2006. In the graph, German results are in green, American in blue. In the comments reader Christopher points out that the UK does not celebrate Mother’s Day on the US date, rather Mothering Sunday on Laetare Sunday, the fourth Sunday in Lent. From 2004 to 2009 this occurred between March 2 and March 22. US Mother’s Day in contrast ranged from May 1 to May 7. I went back and examined the USA and UK data more closely. The Christmas and Valentine’s Day peaks coincide perfectly but there is nothing in the UK data corresponding to the US Mother’s Day peak. I was too hasty in eye-balling the graphs when I wrote the original post. The Mothering Sunday blip is just to the right of the Valentine’s Day peak. Don’t blink or you’ll miss it. Bottom line: there is no pre-Mother’s Day peak in the UK but there is a faintly detectable blip before Mothering Sunday. Also: Thanks to reader Ed C. for solving the problem of the missing Mother’s Day peak in France—another anomaly explained by the liturgical calendar! Details in the comments. Very interesting. I wasn't aware of this tool. "Mothers Day in France is the last Sunday of the May unless Pentecost is on the same day, in which case it is the first Sunday in June. [In 2009 it was] June 7th because Pentecost is on May 31." In your graph it looks like the French peak falls about that much after the US peak. Given my low regard for all things "wiki" I double checked and confirmed that Fête des Mères falls on the last Sunday of May excepting Pentecost when it pushes into June. I re-checked the raw data. The French Mother's Day dates line up perfectly with the French search peaks--each precedes the holiday by one week. Interesting! But here's a confounder: Mothering Sunday in England (presume same for whole UK) is not in May. It corresponds to Simnel Sunday - 4th Sunday in Lent (always the middle Sunday), so falls on a different date each year, but always in March/April. Perhaps the UK population is so small as to make not much of a blip at those times. Don't know if this would make the May blip in UK inexplicable - giddiness of spring and longer days, perhaps? Thanks for bringing me up to speed on the liturgical calendar. I had no idea. I went back and examined the USA and UK data more closely. The Christmas and Valentine’s Day peaks coincide perfectly but there is nothing in the UK data corresponding to the US Mother’s Day peak. I was too hasty in eye-balling the graphs. But then I checked the Laetare Sunday dates for 2004 to 2009 (they range from March 2 to March 22) against the raw UK data. In each case there is a small blip in traffic the preceding week. So there is no pre-Mother’s Day peak in the UK but there is a faintly detectable blip before Mothering Sunday. There you go. I’ll update the main post with a new graphic. I do love it when you get all charts and graphs on us. And now I know way more about Mother's Day across the globe than I had ever thought possible. I just tried running Google trends on the word stink and it shows that September is the stinkiest month. 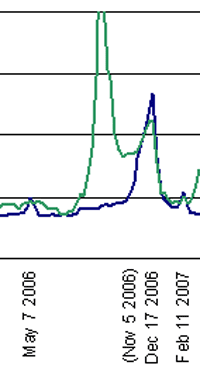 Searches for lavendar peak during the first half of July each year. Taste is queried most often during the last week in June every year. I wonder why? Searches for medicine decrease just before Christmas, which might explain why the days after Christmas have the highest mortality rates. Obesity is a hot topic in the spring and fall but not summer or at Christmas. Exercise shows a clear New Year's resolution effect. I am Xer Etereo (My real name is Isaías, but lets keep that a secret), and I am one of the few people who have a blog about perfumes in Spanish. http://enfragante.blogspot.com/ (ignore the couple of posts on proper clothing). It is still very young and very amateurish, but I hope I can make it better. I own your book in both print and audio version and some of the information you share on this blog is pure gold. I would love to share some of it to my fellow Spanish-speaking enthusiasts, always giving due credit of course. I do not know how you obtained those graphs, but I would like ask for your permision to use them along with some bits of info I found while reading your blog. May I? By the way, I much prefer the english title over the "Wisdom of the nose" translation. I generated the graphs by exporting the Google Trend data into MS Excel. Feel free to use with attribution and a link back to First Nerve (the statistics gnomes in the sub-basement love to see their work cited! ).